After my recent twin tablesaw build I had to deal with a mobile cabinet full of hardware that used to reside under my old TS. I had planned for this and emptied the previous corner cabinet made of cabinets I reclaimed from a closed Blockbuster. Made a list of things I wanted stored for my smaller drill press station. That took up one drawer. To the left I had just enough open space to make drawers that fit 12×18 Durham plastic parts trays I got from a closed auto shop. Color is important here, a recent theme as I have found my memory works better when I associate something with a color. Thus the drawers for hardware nuts and bolts are gray while the cabinet framework is yellow. (no other cabinets are yellow in shop) The drill press drawer was a template for another project that I sized down and kept the stain color. The bottom panels I had from neighbors cabinet that he wanted gone. They matched, so so but this is for the shop so it is good enough. On the far right side I have a nice 22 inch deep drawer for more wood storage of that length. Underneath is the mobile cabinet that was the primary goal to find a place for. The drawer handles are the same design as my twin tablesaw cabinet. I had made jigs to manufacture and install them so I got a 2nd chance to use them. Project cost came to $90. Had to buy contact cement and a set of 10 drawer slides for my parts bins, the others I had in stock as leftovers from other builds. Even the Formica and MDF was leftover from some build last year. This is probably a lot of time and effort for most that use our hobby to create income. Painted cabinets, custom handles, Formica tops and such are not needed. BUT, I do not do work outside the house so I have the time and inclination to do so. Some days I cannot decide if I just like to tinker and organize the shop or actually making something for the house. That looks awesome, Gunny. Listen, I gotta hand it to you. When you posted the rolling stump project recently, I thought to myself “how in the world can he ever top this?” Well, you’ve done it! Nice! I wish I had your organization skills. That looks awesome, Gunny. Listen, I gotta hand it to you. When you posted the rolling stump project recently, I thought to myself “how in the world can he ever top this?” Well, you ve done it! Thanks! My next trick will be making the gate and shop doors not open into one another. Seems I outsmarted myself when I added onto the shop and moved the doors 3 feet toward the gate opening. Looks good, and fits the need. Nice work. Would you believe this started when I was a kid and played with Lego blocks? Hated having to dig through a pile to find a piece so I kept adding parts bins until every piece or grouped pieces had a bin. Have to dig up a picture from an old album. Now if I could apply same principle to my workbenches I might have more space. Good organisation is a key of successful project making process – works for me pretty good. Would you believe this started when I was a kid and played with Lego blocks? Such youngsters. Lego blocks? I grew up on Mattel Fanner 50s. 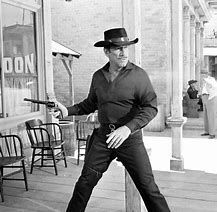 I could out-draw Matt Dillon in the opening of Gunsmoke. I even got in big trouble sawing the knight from my brother’s chess set in half so I could glue it to my Mattel holster and be like Paladin. And the young folks say: What? Who? Never was much of a Lego kid. Watched many a program myself..
Well done. The formica top is well worth the time and $$ to install. It will last forever and take a lot of punishment without failing. There is a lot of storage space in the drawers as well. The drawer organizers are also a great idea. Too many of my drawers have stuff piled in them making finding the item I need a pain. It also looks like the extension for the mitersaw can double as a support table for the drill press. Your level of organization inspires me. This is a very nice storage cabinet and it will serve your shop well. Thanks for the many comments guys, really made my day!